The new outreach puts tools right in patient’s hands on their own device while in the waiting and exam rooms for easy doctor/patient dialogue. A recent report from the Centers for Disease Control and Prevention (CDC) finds that 84 million American adults (more than 1 in 3) have prediabetes, a condition in which blood glucose (sugar) levels are high, but not high enough yet to be classified as type 2 diabetes. People with prediabetes have increased risks to their long-term health, including developing type 2 diabetes, heart attack, and stroke. Nearly 90 percent of people with prediabetes are not aware they have the condition. Last year, the American Diabetes Association (ADA), American Medical Association (AMA), and CDC, along with the Ad Council, released PSAs that helped hundreds of thousands of Americans learn their risk for developing type 2 diabetes by directing people to take a Type 2 Diabetes/Prediabetes Risk Test. 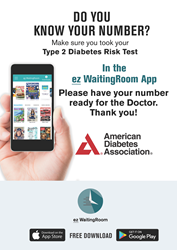 The American Diabetes Association, along with the ez WaitingRoom™ app is seeking to reach the many millions more that need to take the Type 2 Diabetes Risk Test. 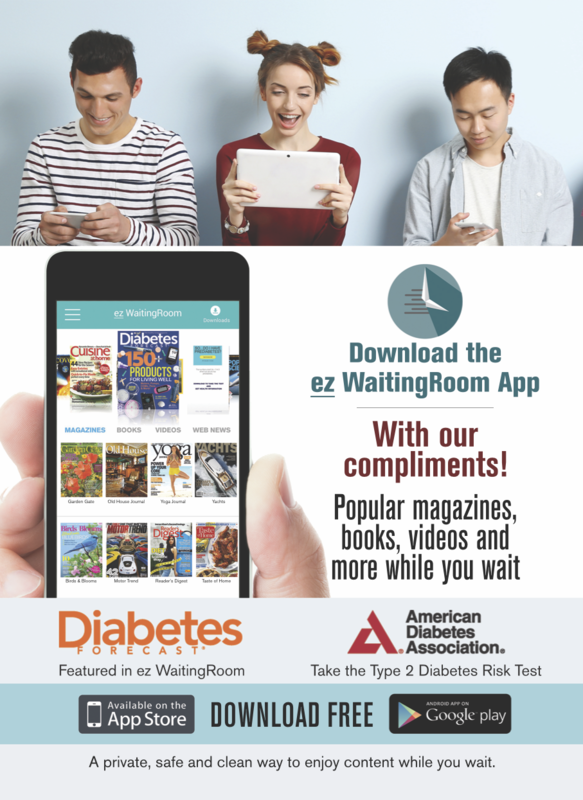 The ez WaitingRoom™ app offers people a “perfect way to spend a minute” where they can take the one-minute Type 2 Diabetes Risk Test while waiting for their doctor’s visit to start. The app offers much more than just the Type 2 Diabetes Risk Test; it also brings a host of free entertainment and information offerings right on the patient’s own smartphone or tablet — popular magazines, novellas and short stories, videos from Guinness World Records®, popular news and social influencer feeds – all for free to patient and doctor. EZ Waiting Room, LLC is proud to lend its support to the campaign, which raises the urgency of prediabetes and emphasizes the positive message that prediabetes can often be reversed through everyday lifestyle changes. The campaign encourages people, reinforced by doctors and their staff, to take a short Type 2 Diabetes Risk Test within the ez WaitingRoom™ app to learn their risk and speak with their doctor to confirm their diagnosis. Prediabetes can often be reversed through weight loss, diet changes, and increased physical activity. Diagnosis is critical, as research shows that people are much more likely to make the necessary lifestyle changes once they are aware of their condition. A rise in incidence of type 2 diabetes presents a significant threat to people in America, increasing healthcare costs across the country. In an effort to reverse this trend, EZ Waiting Room, LLC is supporting the national effort and working to make an impact in the community through the national launch of the ez WaitingRoom™ app and collaboration with the ADA. Download the app at http://www.ezwaitingroom.com or directly at the app stores, iOS/Android, and additional information on the overall campaign is available online at http://www.doihaveprediabetes.org. EZ Waiting Room LLC (EZWR), a NJIT Health IT Connections company, provides a platform for health care providers to deliver premium entertainment and quality healthcare information to their patients. Utilizing mobile technologies to facilitate the delivery of quality information, EZWR seeks to improve the healthcare experience and its outcomes.